Pons Aelius was the Roman name for the port at Newcastle and it played a significant role in guarding a Roman bridge across the Tyne. Pons was the Latin word for bridge, so Pons Aelius was the name of both the fort and the bridge at Newcastle. In fact Pons Aelius can be translated to mean ‘the Bridge of Hadrian’ as Aelius was the family name of the Emperor who gave his name to the Roman Wall that passed through Newcastle upon Tyne. 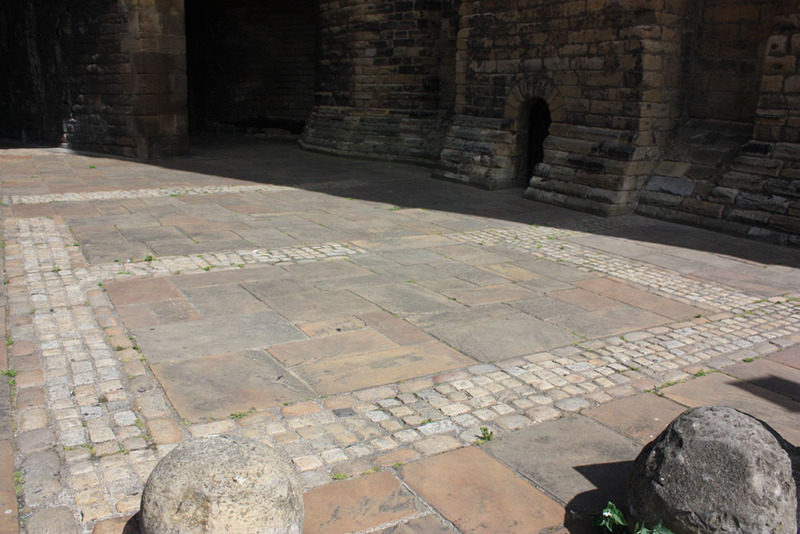 The Roman bridge at Newcastle was built of timber being a wooden-decked platform on stone piers. It predated the fort and may have continued in use for many centuries. Although it is likely to have been rebuilt and repaired several times during those passing centuries, records suggest that the bridge, or at least a bridge, still stood in Norman times and if this is so then it was not finally destroyed until 1248 during a raging fire. It is very possible that the medieval bridge that replaced the burned structure still utilised the Roman foundations. Pons Aelius existed by 213AD and overlooked the Tyne on a site now occupied by the castle. Archaeology suggests a market was held in the fort between 270AD and 360AD. Outside the fort, to the west, a Roman civilian village existed in the Hanover Street area. The Medieval bridge at Newcastle on the site of the earlier Roman bridge. There were two Roman forts within the boundaries of the present city of Newcastle upon Tyne. The other fort was at Benwell in the western suburbs of the city where there was a fort on Hadrian’s Wall called Condercum. Between Benwell and Newcastle’s city centre Hadrian’s Wall more or less followed the course of what is now the Westgate Road. The road was built along the site of a Roman defensive ditch just north of Hadrian’s Wall. ‘Benwell’, Condercum’s later name is of Anglo-Saxon origin, deriving from ‘Beonnam-Wall’ meaning a ‘place within the wall’. Today most of what remains of the fort at Benwell is largely buried beneath modern housing but the defensive Roman ditch called the ‘Vallum’ can still be seen along with the nearby ruins of a Roman temple dedicated to a local god called Antenociticus. Initially the Roman bridge and fort of Pons Aelius at Newcastle formed the eastern terminus of Hadrian’s Wall but later the wall was extended three miles east where a fort called Segedunum was built at what we now call Wallsend. The fort of Segedunum was strategically located at the point where a short northward flowing section of the River Tyne suddenly turns east towards the sea. East of Wallsend, the broad, tidal Tyne formed a natural continuation of the Roman defences with one of the defensive walls of the Wallsend fort actually extending into the River Tyne itself. Over on the south side of the river at the mouth of the Tyne the defences were further supplemented by the fort and Roman supply port of Arbeia at South Shields. Following the collapse of Roman Britain, around 450AD, Newcastle’s history was plunged into darkness. In the Anglo-Saxon era Bede made a reference to a place called Ad Murum that could be Newcastle, while a later Norman writer, Symeon of Durham, mentioned a Saxon settlement at Newcastle called Monkchester. Notably, six-hundred, eighth century Anglo-Saxon Christian burials have been found in the fort but this is not a lot for a period extending over 600 years from 450AD to 1066. Anglo-Saxon Northumbria was a centre of culture and learning with Jarrow, Wearmouth and Lindisfarne being places of renown. Strangely, despite its importance today, Newcastle’s history in this period is obscure. Bede who lived on the banks of the Tyne at Jarrow had mentioned the place called Ad Murum near Hadrian’s Wall, where a King of Wessex and a son of Penda, King of Mercia, were converted to Christianity. Benwell, Monkchester, Walbottle and Newburn have all been suggested as sites for Ad Murum, based on Bede’s description of its distance from Jarrow. One other possibility is that it was Pandon. Also historically called Pampeden, the Saxon settlement of Pandon lay within Hadrian’s Wall to the east of the Pandon Burn, and was possibly larger than Monkchester. 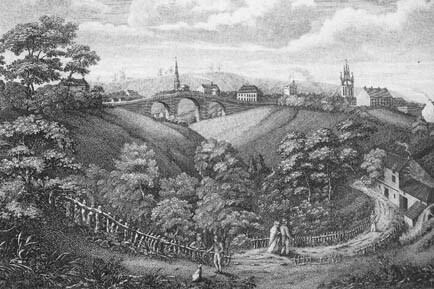 The burn has gone, filled in during the nineteenth century, but remembered in a street called Pandon above the Quayside between the Tyne Bridge and Millennium Bridge. Manor Chare follows its tributary, the Erick Burn and a restaurant at Stockbridge House marks a bridge across this burn. Pandon became a medieval industrial town. In 1294 a ship (a galley) was built for Edward I at the mouth of the Pandon Burn, where the law courts now stand on Newcastle Quayside. Edward I allowed Newcastle to purchase Pandon in 1299, ending its independence. In 1307 it was enclosed within the easterly sections of the town wall. It was not the first time the place had found itself enclosed within the protective defences of a wall.